Sometimes the need to look sharp conflicts with other practical aspects of dressing. The uniquely woven design causes the alternating stripes to pucker, which creates a stiff appearance. This stiffness means that you will never have to press a seersucker suit. Blue seersucker suit also have a well-earned reputation for being easily washable and drying quickly. Seersucker is one hundred percent cotton and the puckering of the fabric causes greater air circulation, making it ideal for hot summer days. Blue seersucker suit are versatile because they offer the aforementioned conveniences and are appropriate for many situations. 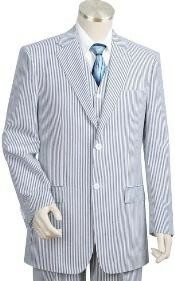 One can wear a seersucker suit to church, work, outdoor parties and weddings, and semi-casual settings. There is a variety of colors available, but blue and white is the classic look. Seersuckers have a long legacy ranging from the sultry climate . This fabric has been used by railroad workers and businessmen alike, showing its true versatility. This classic look certainly is not outdated though, as designers are cutting seersucker into modernized suits. You get the best of both worlds with seersucker suits, sporting a classic yet innovative look while keeping cool on hot days and having a low-maintenance suit. Seersucker is a versatile fabric for versatile men, it is for the man who knows how to look good and work hard. If you are the type of man who isn't afraid to get his hands dirty but knows how to clean up nicely, then this is the suit for you. 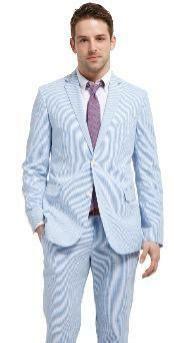 If you are interested in seersucker suits, consider buying the classic blue suit. 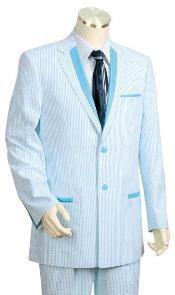 The classic seersucker suit is light blue and white. The puckered stripes are usually white and the other stripes are usually blue, but they also come in other colors. 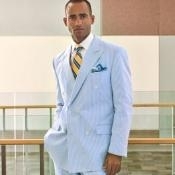 In addition to being a classic look, light blue and white also convey a sense of relaxed professionalism. Blue is known as a calming color and exudes a sense of cool-headedness. If these are qualities you wish to embody and you want a cool and convenient suit, then the blue suit style is perfect for you. 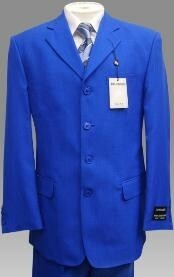 While similar to the light blue suit, a bright blue suit adds a degree of vibrancy and subtle intensity to the style. The brightness suggests vivacity and energy, highly prized virtues in today's world. Despite the energy radiated from the bright blue coloration, this suit still retains its self-possessed vibe. This suit says that you have fire in your heart and ice in your veins. Whether you are going for the more relaxed light blue or the more intense bright blue, there is a seersucker suit for everyone.